Sri Nrusinghanath, the great temple of Odisha in India, is situated at the foot hills of Gandhamardhan Hill in Bargarh. Some six hundred years ago, a woman Jamuna Kandhuni as referred in the book "Nrusingha Charitra" composed a Kavya that sings the glory of Marjara Keshari in regard to suppression and repression of torture and tyranny of Musika Daitya. According to the legend,when people were greatly afflicted by Musika Daitya (the incarnate Mouse Demon), Vishnu Mani in the appearance(Incarnation) of Marjara Keshari,in His Feline Form,ran to eat the demonic mouse form - Musika Daitya who never came out from the tunnel and Marjara Keshari waited from that day. The temple is reputed from that day with this mythologicla history. This story is symbolic of the grounding the demonic evil power of tyranny and torture that never dared to come out further and Lord Nrusinghnath alias Marjara Keshari has been guarding it since then. According to Huen Tsang, the Chinese traveler, this place was a centre of Buddhist scriptural learning. Lord Nrushinghanath is a much-adored deity of Odisha and a great fair is held in his honour on the 14th day of bright fortnight in the month of Vaisakha. 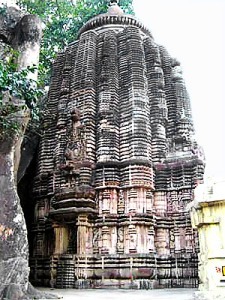 According to Odia and Devnagari inscriptions, the temple was built by Baijal Dev in early 15th century AD. The temple is constructed in Odishan style of architecture.